When P.L. Blair isn't mixing magic, murder and creatures from mythology and folklore in her Portals series of fantasy/detective novels, she blogs and writes the occasional column and news release for other publications. Her background is in the news business, where she's spent more than 30 years as a reporter for newspapers in Texas and Wyoming. Her current news-gathering gig is with Sheridan Media, an organization based in Sheridan, Wyo., that operates nine radio stations in northeastern Wyoming, a weekly ad circular (The Country Bounty) and an online news publication, www.sheridanmedia.com. A native of Tyler, Texas, Blair has lived in Sheridan for more than 20 years. (Her publisher, Studio See Publishing LLC, is also based in Sheridan.) Her "family" includes a basset hound, longhaired dachshund, a Jack Russell terrier and a cat. All are rescues. Blair describes herself as an avid and eclectic reader, a lover of jigsaw puzzles, and a staunch advocate of rescuing dogs and cats (and other critters). When not writing or reading - or covering news for Sheridan Media - she delves into research. Her hobbies include researching pedigrees of quarter horses and Thoroughbreds (two of her favorite horse breeds). 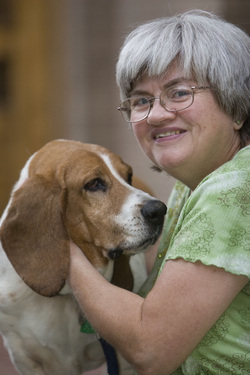 The photo is of Blair with Shilo, her "senior citizen" basset hound. Shilo was 10 years old when Blair adopted her from Wyoming Basset Hound Rescue. She lived to the ripe old age of 15 and is remembered with much love.